Sometimes lunchtime is the only part of the day when I can sneak off for a beer. That always left Roots out of the equation on weekdays, since they didn't open until later. So there was much rejoicing when John reported that Roots would start serving lunch. For now it's just Wednesday thru Friday, but next month they'll open every day. Mind you, the food is still a bit basic -- mainly sandwiches with potato chips -- but I'm glad the beer menu is accessible at midday now. Dave and I headed down there today. 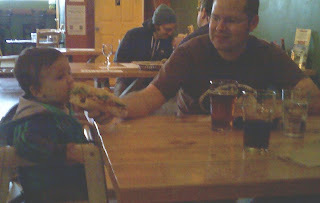 He had little Vaughn along, and he couldn't help but notice that a couple other Mr. Moms also showed up for lunch with the little ones in tow. Way to go, Dave, you're in a demographic now! Something I don't recall seeing at Roots before today: a guest tap. They had Alameda Juniper Porter on tap. I've always wanted to be in a demographic! Alcoholic Father wasn't quite what I had in mind, but at least I'm in good company drinking good beer.